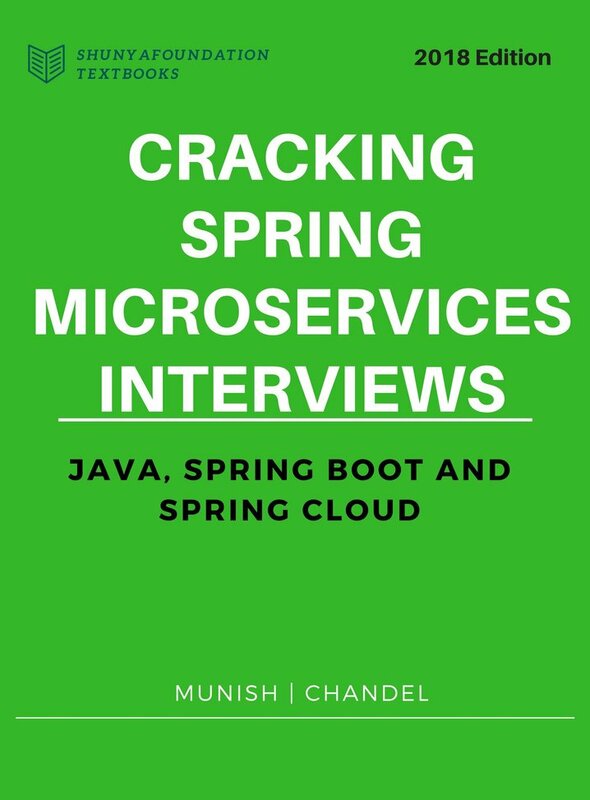 Spring Framework - MVC, Dependency Injection, Spring Hibernate, Spring Data JPA, Spring Boot and Spring Cloud for Microservices Architecture. The Spring Framework is an application framework and inversion of control container for the Java platform. It’s different modules are widely used in most Java Projects across IT Industry. What are different Bean Scopes? Two Beans with same name exists in the AppContext, how to resolve them during autowiring? Service’s first method calls its second method annotated with Async annotation, what will be behavior? How will you create a single threaded pipeline for a particular task execution using Spring? How to handle Basic Auth in Spring RestTemplate? How will you design & implement a referral program using Spring MVC? using unique Affiliation id assigned to brokers? How will you Design and implement a highly scalable Quote Engine Using Spring MVC? - Deferred Result, Async Processing? How to intercept HTTP Rest calls that take too much time in processing? How to implement Long Polling using Spring MVC? How to implement a Download Server with Spring MVC that does not block Servlet Container Thread? File uploading in Spring MVC? High Level approach to integrate your web app with facebook. How to prevent duplicate form submission in spring mvc? How to send errors back to form using PRG Pattern? Setter vs Constructor based dependency injection in spring? pros and cons of each? How to prevent lost updates using Hibernate/JDBC/Data-JPA? How to stream all records from a table using Spring Data JPA? How does Projections work in Spring Data JPA? LockingModeType Optimistic/Pessimistic and Force Increment in Spring Data JPA. How to store Tags List<String> in JPA? Spring, JPA, and Hibernate - how to increment a counter without concurrency issues? How will you map id of one table to be served a id in another table using Hibernate? What could be a real usecase? What are different approaches for implementing inheritance hierarchy in JPA/Hibernate? Can Hibernate SessionFactory and Session be used across multiple threads safely? What is Lazy Loading? How to enable it? How to allow web layer to access lazily loaded attributes? What is Dirty Checking in Hibernate? What is difference between get and load in hibernate? What is advantages and disadvantages of using a ORM? What is a detached object in hibernate? What are different instance states in hibernate? What is a named query? how will you create a named query? How to invoke a stored procedure using Hibernate? How to debug Hibernate SQL statements? What is difference between a sorted collection and ordered collection in hibernate? How will you make sure that email is only sent if the transaction succeeds in the givens service method? How to implement Optimistic Locking in hibernate? What is Spring Boot? What are benefits? What is benefit of Embedded Servlet Container? What are available options for servlet containers in spring boot? How will you start your Spring Boot application at a Random Port? How will you install Spring Boot App as a service in Centos or Ubuntu? How to integrate Spring Boot Application with OAuth2 provider like Facebook or Google? How is Web Client different from Rest Template? How to create a Custom Spring Boot Banner? How will you implement Cache Busting for Serving Static resource from Spring Boot Web Application. What are Cloud Native Apps? What are principles of Microservices Architecture - 12 factor APP? It is always better to practice on a project than to just cram different questions from a book.